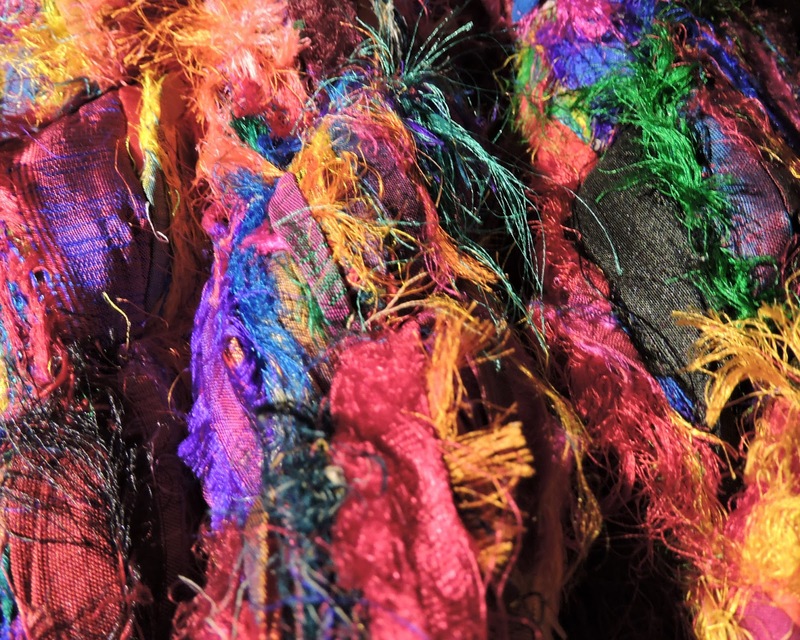 I couldn't resist the alliteration, but if I were going to give it another name, it would be Rainbow Crow shawl, because the soft effect of the frayed edges of the recycled sari silk ribbon and all the colors reminds me of the story of Rainbow Crow. By super speedy- you can make a small version of this shawl in an evening with 4 skeins of Darn Good Yarn's Tibet Jewels. The full sized version in my photos is made using 7 skeins and took 2 evenings of tv watching. Probably 6 hours? Maybe less. 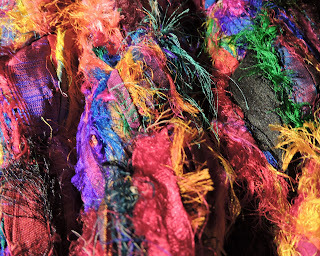 Tibet Jewels is the easiest of the sari ribbons I've found to wind into balls, and it has so much texture and color it's just amazing. The 4 ball version- the finished size without the fringe is 52 inches along the hypotenuse and 26 inches deep. 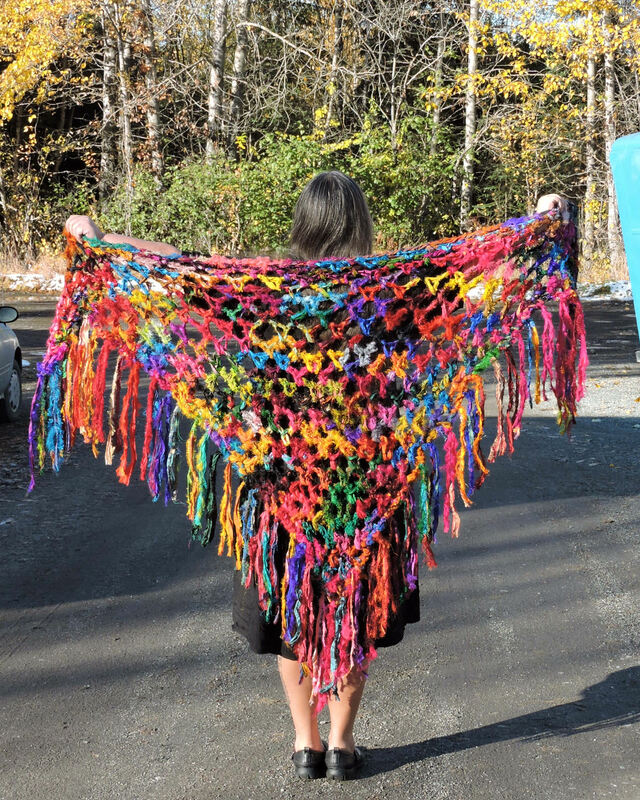 So this is a bottom up shawl, and once you start, it just flies off your hook. Row 4: Ch 5, sc in same loop, ch 3, sc in next loop, work across the same way- at the last loop, ch 2, tr in ch 3 of beginning ch 5 of previous row. Keep repeating Row 4. Each row will be one loop wider than the row before it. For the 4 skein variation- when you get close to the end of the 3rd ball of yarn, finish that row and if you need to add in the 4th skein to finish, do that. Then break off leaving the tail long enough to be one of the fringe, and cut your fringe. Put a fringe at the base of each row along the short sides, and one in the center of the beginning chain 7. 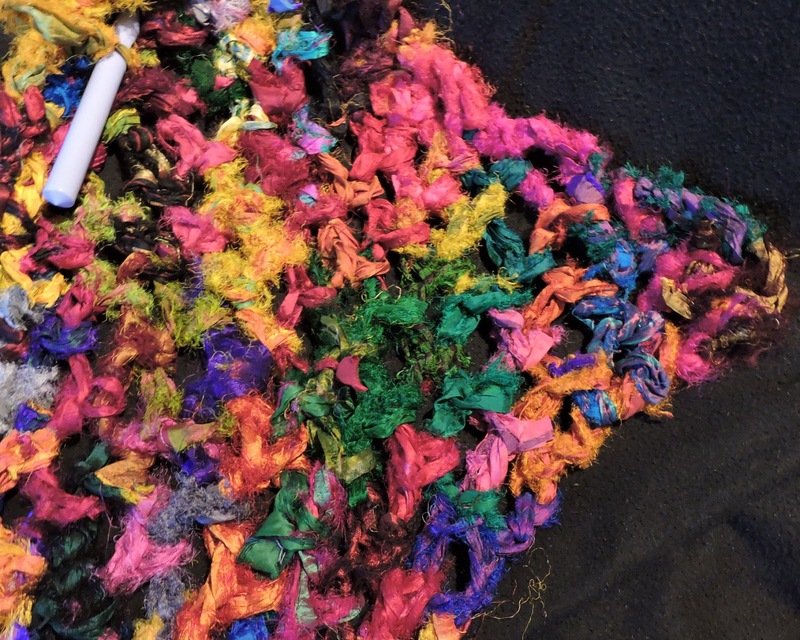 Attach the fringe by inserting your P hook into the stitch at the base of each row- where they join up, and fold the fringe in half, pull a loop though, then pull the ends through the loop. 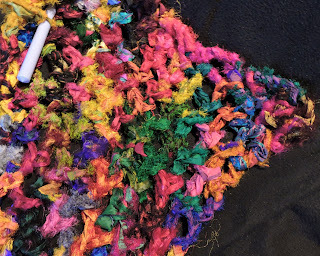 Copying the text to make this shawl for myself with an acrylic yarn from Lion Brand of which I've got a few skeins stashed. I didn't know why I hadn't used them before, now I do! Thanks again for a GREAT blog! !